Nothing beats the Universal Century universe of Mobile Suit Gundam. Where Gundam Wing can put an otaku to sleep with it's angst, the 08th MS Team always hits the mark, proving that five core pilots are not always better than one. Ok, maybe there are some continuity errors that don't quite match the first Gundam series, but that aspect is forgettable. 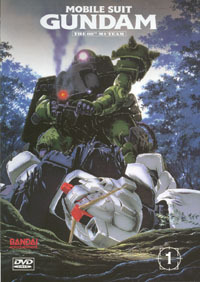 The series is primarily made up of a group of single episodes, each of which showcases a particular mission that the 08th MS Team must undertake. As the series advances, the underlying Zeon plot involving the woman named Aina that Shiro met in space beings to grow. But, for this volume, the initial meeting between the two characters is the main focus as well as the first two missions of the team. At the same time, what makes the show fun to watch is the situations that befall the supporting cast. The first episode starts out rather slowly, and it isn't until the commercial break that the characters and the action shown become even remotely interesting. Still, by the end of the episode I found myself glued to the series, and things only became more interesting as Shiro learns to cope as the leader of the rather unique band of soldiers. Episode two is, more or less, an episode where Shiro has to prove himself to his new comrades, but it is quite enjoyable to see just how far he will go to destroy the enemy. The spotlight of the volume has got to be episode three, where the band of guerilla fighters is introduced. The episode just screams 'fan service!' in every possible way and is a total riot to watch. The English dub gives a rather unique experience in terms of the variety of voices. Occasionally you can pick out some voices that were used in Outlaw Star and few of the other Bandai and Pioneer releases, but overall it's a pretty original listening experience. It's also a pretty solid dub in it's own right with some very tight performances, setting it apart from the Mobile Suit Gundam dub which has more than it's share of voices from Gundam Wing. Moving on to the DVD, the menus used in this release are rather unique. The navigation is made up of four graphical buttons that represent the seemingly universal options of play, scene access, languages, and extras. The actual menus are pretty unique as well. When clicking on options in the extras, it loads a new picture for that option and highlights the choice. The only problem is it takes a second or two to load. Oh, and the extras include a version of the opening with no credits and a bonus Japanese promotional trailer for the series. Naturally, the version that is aired on Cartoon Network has quite a few violence edits, language changes, and digital swimsuits… but spotting the differences is half the fun of watching it uncut on DVD. Sure, the show throws quite a bit of cannon out the window, but boy, does it do it in style. If there were ever a Gundam game I'd like to play, it'd have to be using the Dreamcast's game engine with this show's storyline.